Generate subtotal or multi-level reports and leverage Excel’s functionality to format, chart and highlight important information and get your reports to look the way you want. Link reports together by specified criteria to allow users to navigate information and spot trends on their own and automate report actions to create, update and save reports with a single click. Flex can process any SQL query so you can define exactly what you see, from a single value in one cell to thousands of columns and rows. Flex allows you to combine multiple report elements and data sources to build a single comprehensive report while Flex’s innovative technology allows report functions to be changed on the fly. 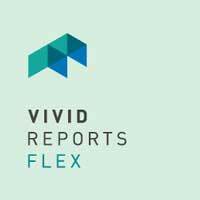 Flex reports can be controlled externally and integrated with other systems, including Vivid Reports CPM Software. Flex is compatible & works with Excel without the use of macros, VBA or special encoding, setup or configuration. It installs within minutes and software updates are downloaded when a user logs in to ensure the latest functionality. A central database and report repository allows definitions to be shared easily while robust security features prevent unauthorized changes by users.